The report identifies many examples of good professional practice, teachers’ use of a range of pedagogies and approaches to learning and their creative use of resources, particularly web-based materials. The report also highlights a number of serious weaknesses which the REC now calls on the DCSF, publishers and RE professional organisations to address. It identifies the ways in which teachers use RE to promote community cohesion and to develop personal and social values, positive attitudes towards those of other religions, and critical thinking. 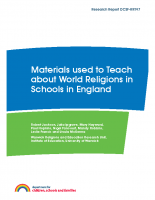 …to examine the materials available to schools for teaching and learning about and from world religions (Buddhism, Christianity, Hinduism, Islam, Judaism and Sikhism were specified as principal religions in the UK) to support community cohesion and promote religious understanding amongst pupils. In particular, it will explore which materials are commonly used by schools and how, what key factors schools should consider when selecting materials, and identify any improvements that can be made to materials to better support cohesion. 3. Quantitative survey of a random sample of nearly 3,000 schools of all types, conducted by post and on-line. Academic reviewers and faith consultants pointed out a high number of errors in the coverage of religions. Much of the material used in RE lessons is generated by the teachers using a mixture of resources many of which were not specifically produced for RE purposes. This trend means that the quality of the materials is dependent on the teacher’s knowledge, skill and commitment.